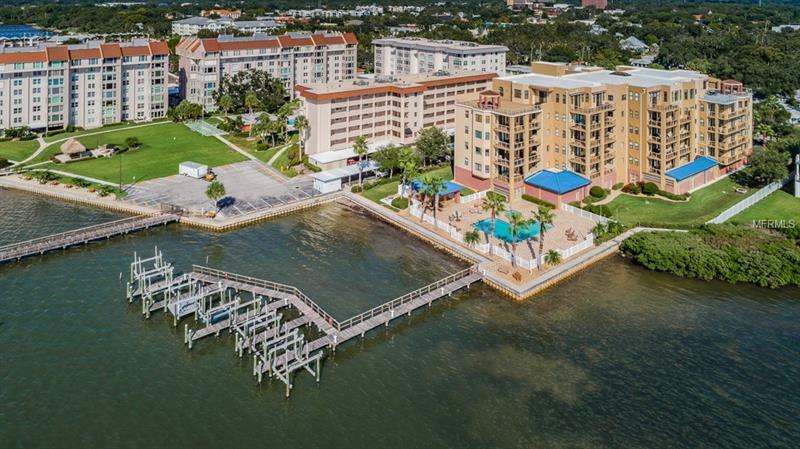 Great opportunity to own a waterfront condo in the prestigious Dunedin Grand. This spacious Biscayne floor plan features 3 bedrooms, 2.5 baths, media room, large foyer with a Miami domed ceiling, enclosed and secured 2-car garage underneath the building. Lots of extras include; high ceilings, crown molding, recessed lighting, granite counter tops in kitchen and bathrooms, large walk-in pantry and laundry room, and tile floors throughout. The home is bright and sunny and boasts a oversized balcony with a southern exposure, which offers views of the water, Clearwater Beach, Caladesi Island and gorgeous sunsets. Conveniently located to vibrant downtown Dunedin, with quick and easy access to all the festivals, restaurants, pubs and local entertainment venues, as well as easy driving distance to beaches, malls and the airport.